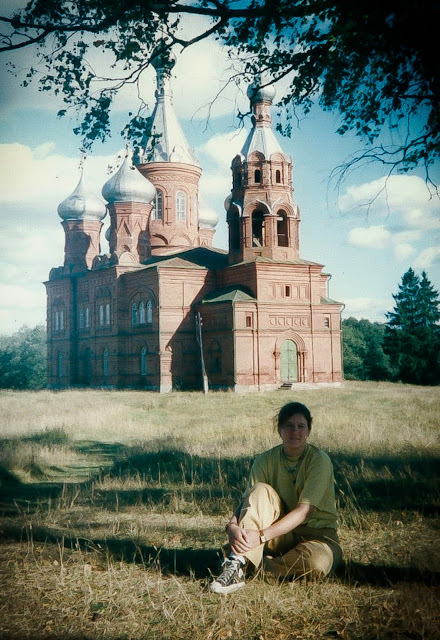 19 year-old Heather sits on the grass with a beautiful red Russian church with spires rising out of the background. The setting is remote, grassy and there are trees behind the church. This was on the grounds of the spring that feeds into the Volga River. The Volga is Russia's largest and longest river and the "life of Russia", the beginning of history in Russia. 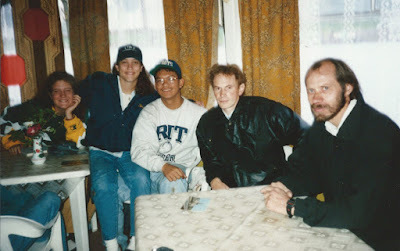 My first time traveling outside of North America was a memorable one, it was with an educational group exchange visit during summer 1995 in the Moscow, Russia area by MIUSA (Mobility International USA). In our group, there were three Deaf students total, a blind boy, two used wheelchairs, one had epilepsy, and the others were typical students. I was newly 19 years old and had just finished my freshman year at Gallaudet U. I’ll talk about communication here, figuratively a little square inch out of a bigger painting of experience that this trip was. 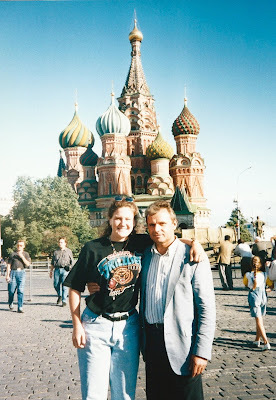 It was during this trip I had a handful of opportunities to gesture and converse with Deaf Russian citizens. 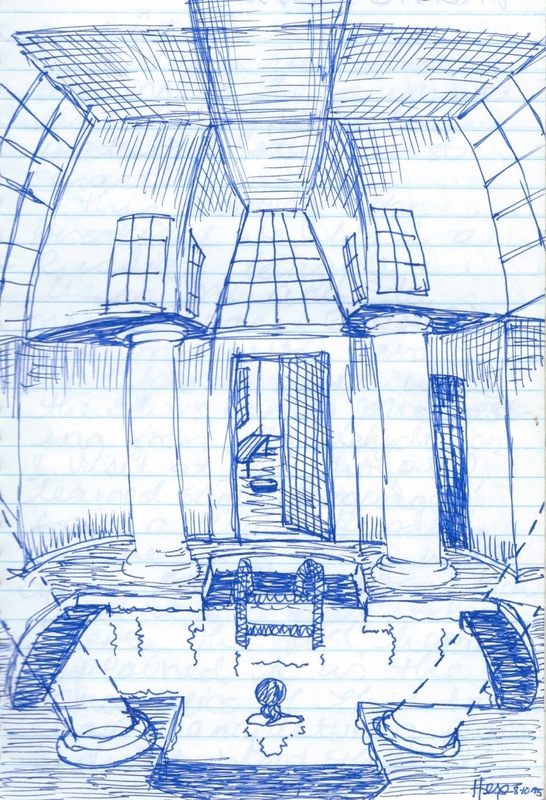 In my trip journal, I wrote in such a naive and upbeat 19 year-old chatter but what was obvious then and still is something I enjoy now is that I love the challenge of communicating with other people without an initial mutual language between us. The American delegation, student with or without various disabilities, dressed up as land animals, improvised our costumes from what we could find in nature. The Russians were the sea creatures (not pictured) and were a hilarious sight! 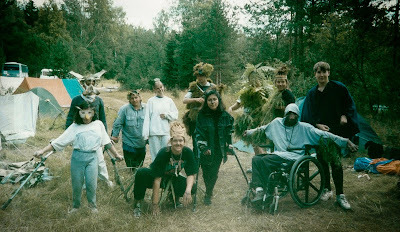 I was an ape, and am crouching in the front of the group in this picture at our campsite along the Volga River. We found a lot of deaf people in Moscow’s Red Square, many were selling souvenirs, and we met a guy in his 40’s whose name I know I got wrong but we’ll call him “Tis”. It was not easy but a rewarding challenge working with gestures. We started to pick out each other’s signs so that it became a mixture of gestures, ASL and Russian sign language! At one point we had our ASL-spoken English interpreter, Russian-English interpreter, Tis, and us Deaf American students in a circle along the side of the Red Square. Our English-speaking group leaders wanted to pass a message along to Tis, the Russian-English interpreter was no use since the Russian she knew was spoken and not signed. The message was spoken in English, translated to ASL to us and we gestured and signed to Tis; and his response went back through us. Fascinating! Heather and "Tis" in the Red Square. St. Basil's Cathedral is in the background. Another ASL and Russian sign language crash experience was when everyone in our exchange group was sent home with different host families for just one night, one of the Deaf students and I were sent home with a Deaf couple who also had a Deaf roommate. We had a hearty meal in their humble kitchen, which of course, had potatoes peeled with the new veggie peeler I gifted the mom and bottles of Coca-Cola purchased earlier at a street kiosk. We stayed up most of the night gesturing, picking up each other’s signs and looking up the Russian word for that English word and vice versa. We were bummed this was just one night, still it was yet another profound experience during my Russia trip. Three American students, Heather, Tracie and Edo, and two Russian men; all are Deaf. The guys were much friendlier than they appear in this photo and were the ones Edo and I chatted with all night with Peter's wife. Peter is in the leather jacket. I'm on the far left. Photo taken August 1995. Over the years, I went on to participate in the Deaflympic Games, where the world, with its many different signed languages, was brought together in one place. I’ve gone on to visit and gesture with deaf citizens in other countries during my travels. Meetings with Deaf people were pre-arranged but often we just somehow find Deaf people by luck. It helps when we sign amongst each other making us visible and then signs of our sighting travel fast through the Deaf community in the area. The first of all the communication barrier ascents, profound due to it’s newness to me, was in Russia where something awoke within me; I felt I was born again. The fire within me liked very much the oxygen that I was in the midst of. 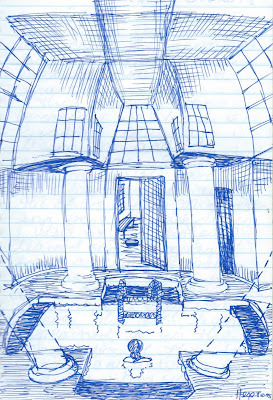 "Fish-eye" sketch in blue ink of a cozy bath house from my Russia 1995 journal. Orion enjoys a chocolate ball from somewhere in his name. 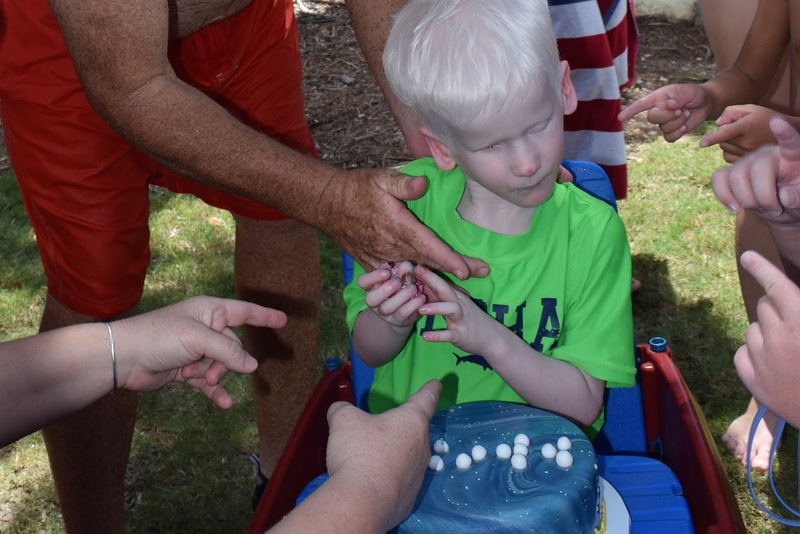 Orion had one of the most unique and DeafBlind-intriguing birthday cakes ever to celebrate his 6th birthday! This special cake was created by Tina and Amy with that. 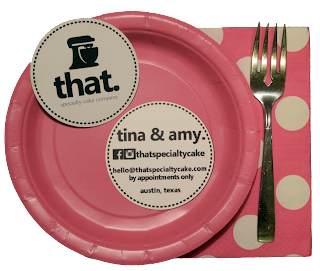 specialty cake company, located in Austin, Texas. 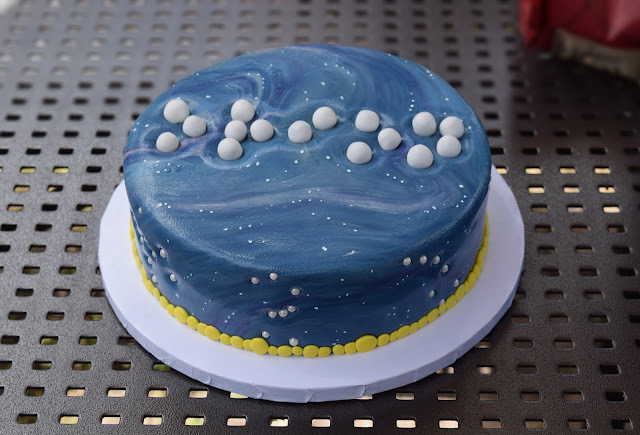 It had beautiful marbleized blue and purple fondant, Orion’s name was spelled in braille with white chocolate balls, and you can see/feel a few candied constellations along the cake’s side. Inside was the chocolatiest triple-chocolate I’ve ever tasted, so yummy that there were none left over after the party. No mistaking whose cake this is, it is Orion's. Image description: A flat, circle blue marbleized fondant covered cake has "o r i o n" spelled in braille chocolate balls on top. Constellations are visible on the sides- Orion and the Big Dipper. Yellow balls are strung around the entire bottom circumference of the cake. Amy and I talked about doing a special tactile and interactive cake for Orion’s 6th birthday, a great idea right from the start! I’ve always included candles for his birthday even though it was so awkward, perhaps a tactile oxymoron, that I wanted him to touch but then didn’t want him touch when they were lit. The chocolate balls were on top of toothpicks that were inserted on top of the cake for Orion himself to remove and enjoy thoroughly on his terms, instead of candles. Happy Birthday To You! (Everyone's finger-pointing "You" at Orion while Dad signs "Birthday" on Orion. He was already fussing when we were about to present the cake to him. To let him know that we were going to have cake, I gave him a cupcake wrapper to help clue him in on what’s going to happen. He’s always had cupcakes for his birthday so this one was going to be a surprise in two ways, it’s not cupcakes and it’s awesome! The wrapper calmed him down as he crunched it in his hands. We set the cake down in front of him sitting in his red wagon, he touched the cake, picked and pulled at the fondant and once he discovered the Orion braille in chocolate balls, he committed to eating them. He totally touched that cake! Each slice a guest had was blessed by Orion’s fingerprints. Orion works on the last braille dot and feels Mom cutting apart the last pieces of cake. A, Orion and S pose with the cake after Orion started picking off the chocolate balls. Amy has a special place in Orion and our family’s life. She was Orion’s first teacher, even though she trained as a teacher of the Deaf, when we moved to Austin, Texas just in time for the 2012-2013 school year. Amy dove in head first, learning how to work with our precious Deafblind 2 year-old son. We immediately saw her on the floor with him, putting herself in his skin (I’d say “his shoes” but Orion doesn’t like wearing them) as well as going to workshops, taking intervener courses and geeking out on DeafBlind strategies. Orion was so very fortunate to have her on his team early on! Now the same Amy we know is in a different setting and is not a stranger to Orion. She’s in the kitchen now, creating eye-catching specialty cakes with her business partner, Tina. She still does intervener work with Orion. Little did I know, she and my husband, Thomas, schemed up yet another awesome surprise cake to celebrate my 40th birthday. that. specialty cake company also made my birthday cake! Two tiers of cake and edible art! Bottom was white cake while the top layer was angel food. Close-Up: A sweet version of me painting a photograph of the kids and I on a sugary easel. Photos of cakes created by that. specialty cake company can be found on Facebook, http://www.facebook.com/thatspeciatlycake and on Instagram, “thatspecialtycake”. 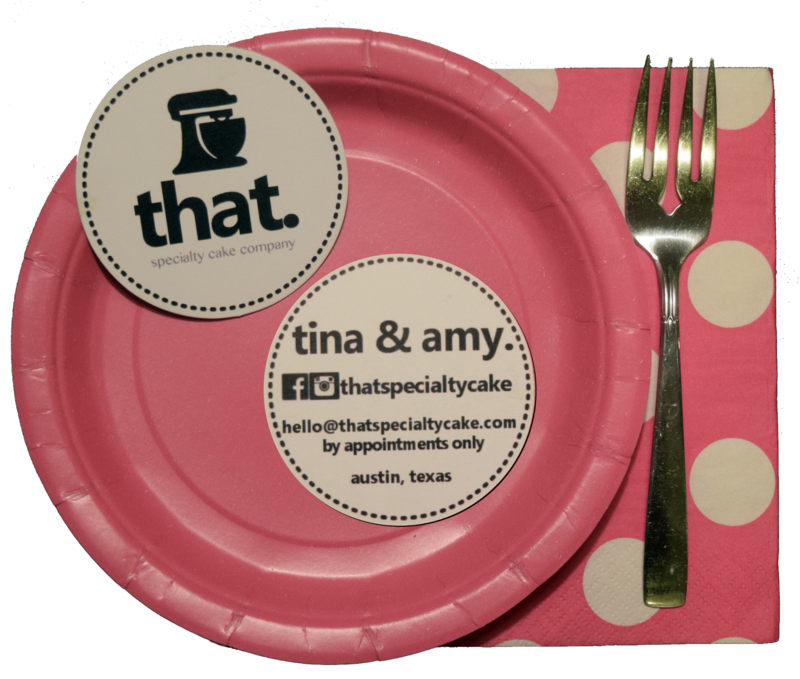 You can make appointments by e-mailing hello(at)thatspecialtycake.com. This video is in American Sign Language. Subtitles and voiceover is in English. Fundraiser: https://www.razoo.com/us/story/Nvfh3g Last day to make a donation is September 10, 2016. 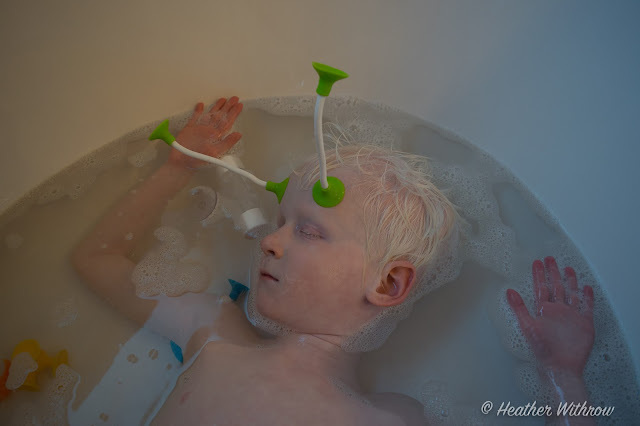 When Orion was a baby, Thomas and I wondered how he would get from where he was as a baby, with fists and Moro reflexes, all the way to a tactile-signing DeafBlind adult. Just like the DeafBlind adults in our Deaf community. “How?” we wondered and it would stay like that for a couple years. Meanwhile, within hours of Orion’s birth in July 2010, we went ahead and started with what we called “signing on the body” with our sign for “MILK". We decided we should go to him rather than expect him to put his little baby hands on top of our hands because that’s simply something infants don’t do, except perhaps grabbing a single finger with their fists. 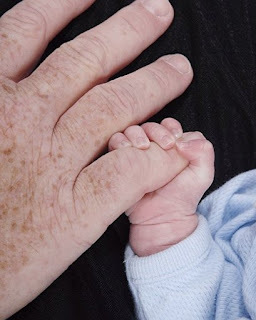 One month old Orion grabs Daddy's pinky finger. Description: Extreme close-up photo where a baby's forearm, while wearing a light blue long sleeved outfit, is visible holding onto an adult's pinkie finger. I’ve always believed in the Hand-Under-Hand strategy for the DeafBlind child’s autonomy, observations, attention checks and participation opportunities. In the past year, I realized we answered the 6 year old question, that one of the pathways to tactile sign language communication was Hand-Under-Hand! Orion is learning that his hands make a difference, with them he is exploring his physical environment, other people’s hands and what their hands are doing. He’s starting to really see with his hands now, bring to life the saying I heard weeks before he was born, “DeafBlind children’s hands are their eyes". We still do use “signing on his body” also known as “touch cues”. What we do these days with Orion is letting him know we were here, then go to his hands (or he finds ours) and start out tactile signing (Tactile ASL, also known as TASL) since he’s getting better with voluntarily following our hand-under-hand action. When Orion doesn’t want to touch our signs, we then switch to signing on him but keep trying to return to TASL. We also continue to use touch cues when the TASL sign is new to him. Also an option is to imitate a motion or action associated with the action, this may speak for itself or is already identical to ASL. For example, to sign “OPEN” for twisting open the peanut butter jar, we hold an imaginary jar with the left hand while the right hand is on top imitating a lefty-loosey twist motion. That is the conceptually appropriate sign for that “OPEN” situation and it is what we actually do to open the jar. Because of their similarities to functional motions, these signs are likely to be among the first in Orion’s sign vocabulary. Somewhere in that mix we must continue to use object cues, which are real objects or a recognizable part of the whole object. Children will understand what the object cue is since they’ve figured out what it’s function is, for example, a bottle, and it is in their hands right now and that’s their reference for what is to come next. Knowing American Sign Language, or any other language, is where you have the ability to talk about something that is not there in front of you nor happening right now. This is why we rely on object cues since Orion is not "there" yet. Orion feels his big brother sign "BUCKLE-TOGETHER". 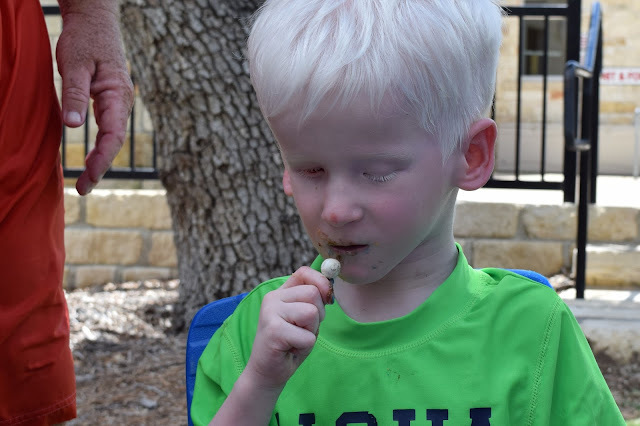 Image description: A white haired 6-year old DeafBlind boy, shirtless and sitting in a black stroller has his hands on top of a 11-year old boy's hands signing "BUCKLE". Hand-under-hand strategy allows Orion to feel his big brother snap together his stroller buckle. Orion may be feeling the same action with the skin of his abdomen. 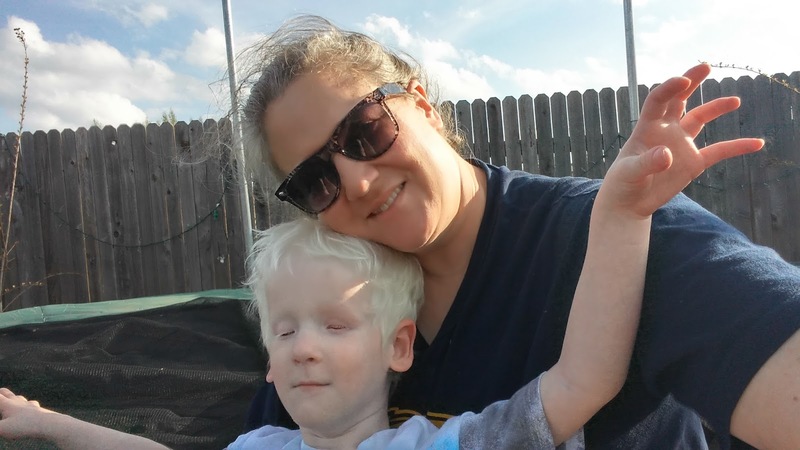 Image description: A white haired 6-year old DeafBlind boy, shirtless and sitting in a black stroller, has his hands on top of a 11-year old boy's hands, connecting two ends of a buckle. Orion still pulls away a lot from our tactile signs and hand-under-hand efforts but we noticed he is willing to “look” longer and longer. At 6 years old we are still seeing a slow but true trend of growth and participation from Orion. It’s a long journey and we need endless springs of patience, but it is still possible! I’ll leave you with an enlightening and affirming quote shared in one of the OHOA Modules*, “Communication at any level is still communication. *Open Hands, Open Access DeafBlind Intervener Learning Modules, http://moodle.nationaldb.org. Here is a video also related to touch cues, body signs and tactile sign language. Orion lovingly hugs his mom's hand. If you’ve met one child who is DeafBlind, you’ve met just one DeafBlind child. The number of DeafBlind kids in the United States is so small, since it’s a low-incidence disability. 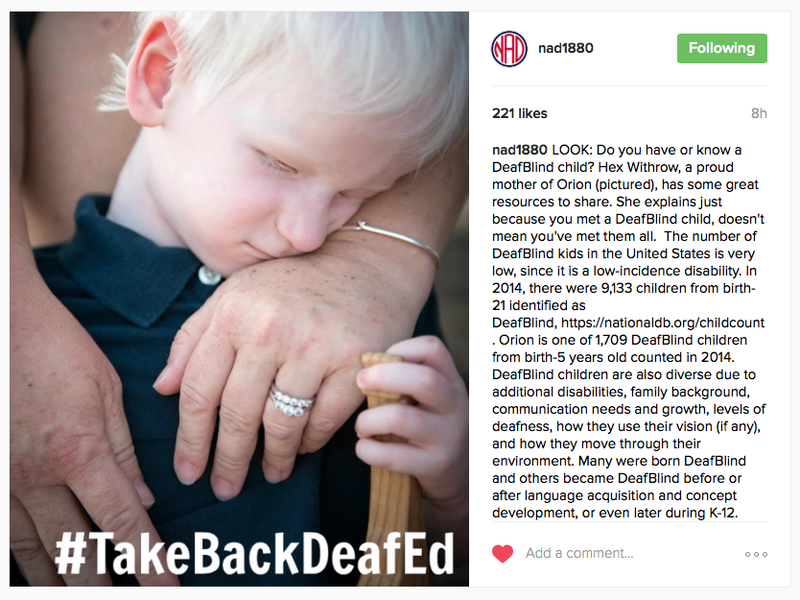 In 2014, there were 9,133 children from birth to 21 identified as DeafBlind, https://nationaldb.org/childcount. My son Orion is one of the 1,709 DeafBlind children from birth to 5 years old counted in 2014. DeafBlind children are also diverse due to additional disabilities, family background, communication needs and growth, levels of deafness, how they use their vision, if any, and how they move through their environment. Many were born DeafBlind and many became DeafBlind before or after language acquisition and concept development, or later in their K-12 educational years. Most importantly, DeafBlind kids have their own personalities and favorite things to do! 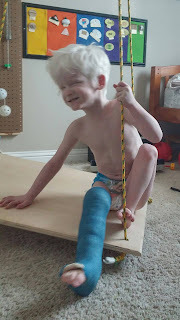 Check out my blog, “A Mom’s Musings”, at http://hexwit.blogspot.com for stories and videos of nearly 6 year old Orion, our family, and links to online resources and information that I found extremely helpful. You can also find Orion and other inspiring children on social media with hashtag searches for #DeafBlindKids, #DeafBlind. The biggest concern is that the contents of the Cogswell-Macy Act needs to happen “yesterday”, our future generation of DeafBlind children are being born, celebrating their first or sixth birthdays soon with their parents advocating for what is appropriate for their precious family member. With the leadership of the National Center on DeafBlindness, funded by the Office of Special Education Programs (OSEP), leaders, educators, interveners and family members of DeafBlind children and adults worked together on specialized module-creating teams over several years developing Open Hands, Open Access (OHOA) DeafBlind Intervener Modules. You can visit the website at http://moodle.nationaldb.org. The are currently 18 OHOA modules available with the final group of modules being field-tested right now and they will be revealed in the not-too-distant future. You don’t need sight nor sound to inspire other people, that’s the gift our children are giving us and the world. 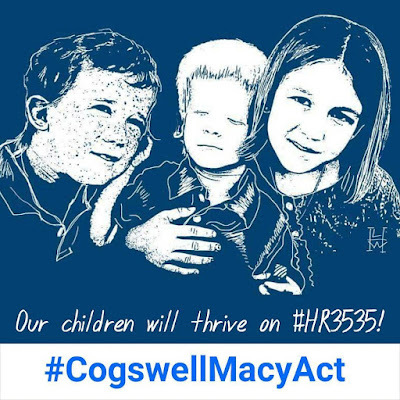 We need to give back to our DeafBlind children by the way of appropriate and meaningful education- we need to pass the Cogswell-Macy Act which has been introduced in the House as #HR3535 but not yet at all in the Senate. To pass an act of Congress is no small feat! In the midst of advocating you still can make a difference by supporting the growth of interveners and Teachers of DeafBlind (TDB). Officially, TDBs are still very new that, at least in Texas where my family lives, there isn’t state certification offered yet like there are for Deaf education, blind and special education, and so on. However, the passion for teaching DeafBlind children have been around for years! Yes, to families there doesn’t seem like there are enough of them. We can help meet this need by the way of scholarships, planning on training, convincing our local college or university to offer certificates or degrees in deafblindness as interveners or teachers! Or even start working in this rewarding field ourselves! 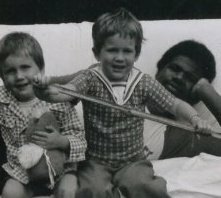 I want to thank each single person, wherever on this planet they are, who stumbled into or sought out the field of educating DeafBlind infants, children and youth. Thank You from the depths of my heart! Sighted children are able to see the tickle monster or The Hand diving in to tickle-bomb them. If you used the same sneaky technique on your DeafBlind child, you're going to scare them. Thomas and I wanted Orion to experience the same thing but in a DeafBlind way- what's similar in both situations is anticipation in a fun way. Orion has no sight or sound* so he's learning mainly through the senses he does have, most commonly known as touch, taste, smell. (There are more senses beyond the 5 senses, too, by the way!) In order for Orion to know we're about to come in, we go ahead and gently touch him on his abdomen, crawl up his chest in a slow-to-quick motion (slow most of the time) to where we ultimately tickle him. *Orion has bilateral cochlear implants. He currently wears just the left processor for brief periods of time in school, especially during music class if he leaves it on. 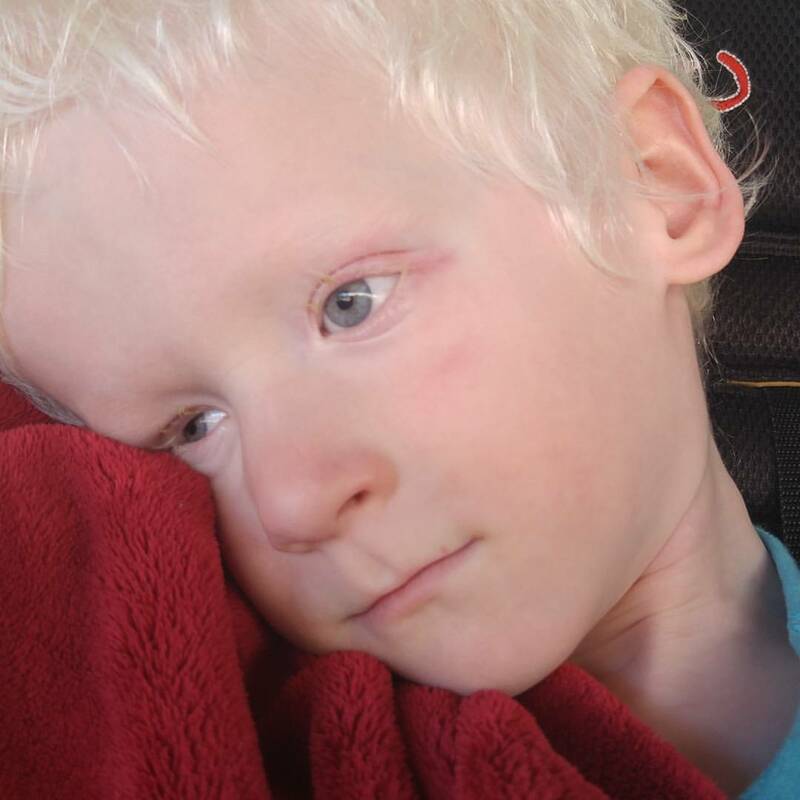 Image description: A close-up photo of a DeafBlind 5 year-old boy with fair skin and white hair seemingly gazes off into the distance while resting the right side of his face onto his favorite plush red blanket. The time we spent "trying on" the new scleral shells paid off on Monday, it told us that the one in his right eye was too small. Orion had both "eyes" in the whole time I was out strolling in the area but by the time I got back into the waiting room, the right eye was GONE! 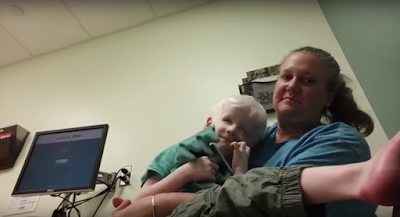 No matter, Randy knew this would happen as it's happened for years with his pediatric patients. The plan: Randy is going to make both shells bigger, the left eye a little bigger, and the right one even bigger and mail them to me this week. Sure enough, they arrived Thursday night while I was out coaching at a track meet! That was only because I confirmed I was comfortable putting them in Orion's eyes. I'm only guessing that if I weren't comfortable, he would just have us stay until the end of the day when he is finished with the eyes. Y'all asked fascinating questions! No, no, they weren't rude and I'm happy to answer them. Yes, Orion has his own eyes and they're really small, it's called microphthalmia. I tell kids they're the size of peanut M&Ms. Just like peanut M&Ms are different sizes and shapes, so are Orion's eyes because they're not identical sizes either. Ironically his smaller right eye has some light perception while his bigger left eye is totally blind. Normal eyes still grow a little after birth but I am not sure about those who have microphthalmia. According to a Q & A the American Academy of Ophthalmology website: "The eyes undergo considerable growth especially during the first two years of life, with a second growth spurt occurring around puberty. The length of the eye of a newborn is about 16.5 mm, while that of a full grown adult is about 24 mm." One of Orion's old scleral shells, which was made while we lived in Maryland, sits next to a dime for size reference in a 2 framed image. The shell is wider than the dime. In the top image, the shell is resting on the table and in the bottom image the shell is flipped over showing the "smooth, scooped out" back part of it that goes over the real eye. The "eyes" that go on top of his micro eyes are really called scleral shells or conformers. 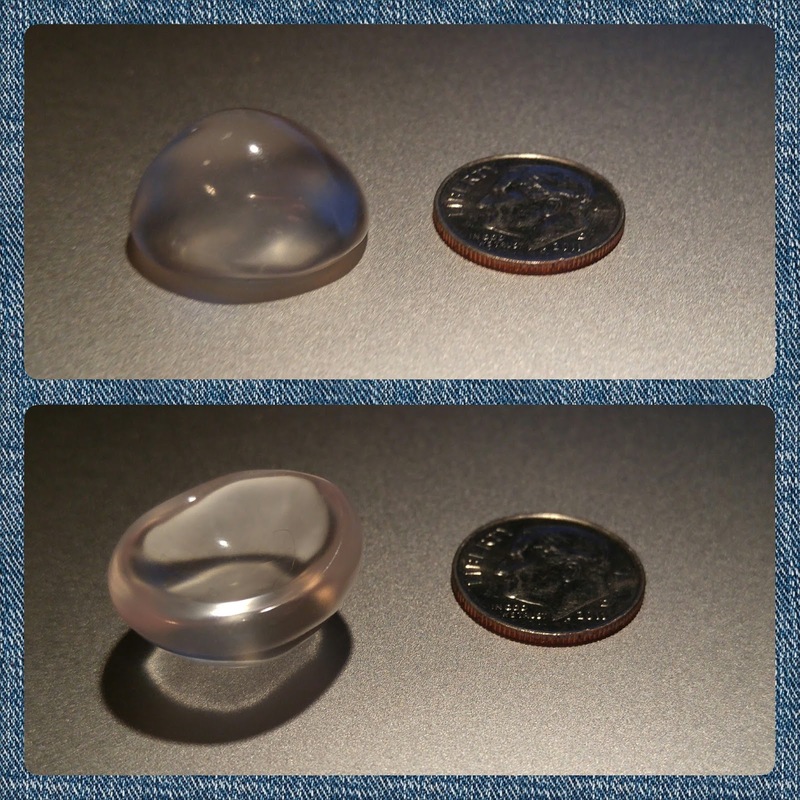 The clear ones look like contact lenses on steroids and aren't really clear anyway. I can confirm that because took a peek through them myself. These conformers do not improve vision even though they look so realistic. Their purpose is for supporting his eyelids, to allow them to blink, to stimulate the bone in the eye socket and sinus region to continue to develop normally, and last but not the least, it improves human connection, too, when they are painted to look realistic. Randy explained that one of his clients noticed that more people talked with her when she had the realistic eyes than when she didn't have them in. It is my understanding, as I've only 5 Orion years of experience on this topic, that you increase the size of the shells during the early childhood years and when your growth slows down, so does the need of changing the size of the shells. It's a no-brainer that Orion's painted eyes would have blue irises. 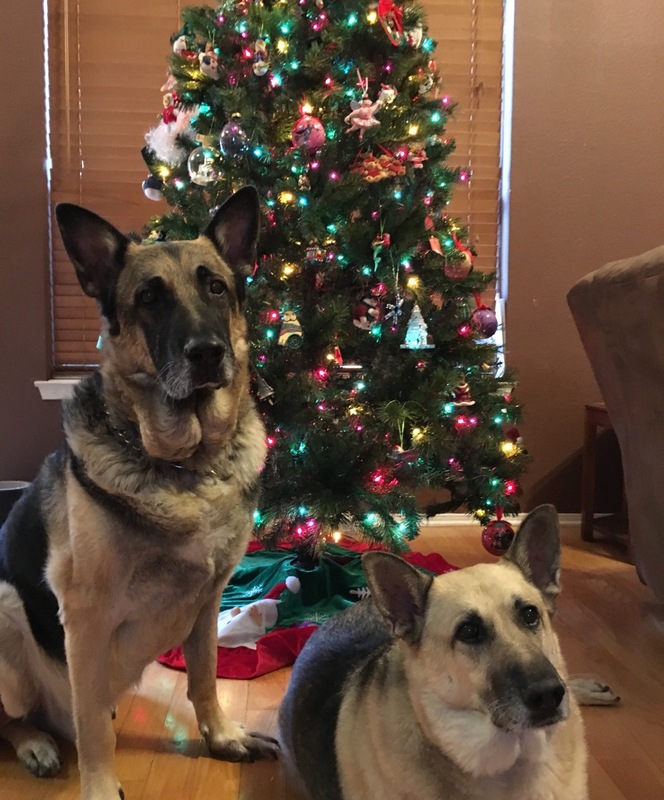 The rest of the family all have blue eyes, too. Orion's real eyes are blue, too. The pupil of Orion's shells will be clear just like our own pupils are clear. It just looks black because it is dark inside our eyeballs. Back to the topic of blinking- if you look at your eyes using a mirror and you blink. Do you notice only the upper lid actually does all the blinking work while the lower lid lounges around? Maybe it's just me but go ahead and try that yourself and see what you find. In Orion's case, when he does not have conformers in, his upper lid is unable to blink. It just hangs there and often it gets behind the lower lid. That often caused him irritation. Leaving in the conformers 24/7 is recommended. I bet you would throw off people who aren't lifting their own weight when you say, "Don't be such a lower eyelid!" Orion wore his first scleral shell at 5 months old (December 2010). He cried for a while when it was first put in but then that was it. No more crying. You can read more about the path that led us to this moment in The Second Opinion: The Ocularist. If his shell fits snugly, he leaves them alone and seems to prefer they stay in because when they're taken out, he rubs his eyes a lot. If they're too small, Orion will pop them out and immediately loses them somewhere or plays with it in his mouth. "I'm Looking For My Son's Eye"
I know many people can relate to this line whether it's their child's, friend's or their own eye! It's funnier later rather than in the moment. I recall looking at Orion and suddenly realizing a shell was missing and after looking around in his crib I'd find it in his happy mouth. So as of this recent Monday, there's an eye looking up from the ground somewhere in Dallas, Texas and a clear "eye" was lost on the world's "busiest" carpet in the world in a bowling alley/roller rink establishment in Lynnwood, Washington. And yeah, I've actually had to answer when asked what I was looking for, "I'm looking for my son's eye." Much to my delight, they helped us look for it. So practical and straight-foward. No-fuss good samaritans. The shells do not hurt Orion. The most fuss he would make is if we don't get them cleaned when they should be cleaned (when he has a cold and gunk builds up on it) or if 6 months has passed since his last polishing. 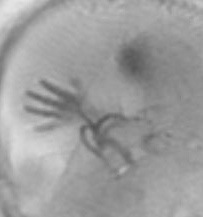 The other times his other 6 tentacles would come out is when we need to take out or put in his scleral shells. Orion is understandably defensive of his face, over his eyes, ears, mouth and nose. It gets better when he understands what is going on and because of this he doesn't go Kraken on the medical professionals. What we do is tap on or near where the doctor will look or do something on. We would offer him the stethoscope, otoscope, tongue depressor, toothbrush or any tool that is to be used. Real things, experiences and routines teach Orion concepts quicker than anything else. The cost of the scleral shells all depends on your health insurance. Our policy with our previous insurer, Kaiser Permanente, had 100% DME coverage. DME means durable medical equipment and that includes wheelchairs, walkers, diapers, and yeah, prostheses! Unfortunately some insurance companies have lower coverage percentages like our current private insurance covers only 75% of the cost of DMEs. If a special needs stroller costs $2,000, we'd have to pay the other 25% which would be $500. Any help we could get was much appreciated, it's just a bummer to step down to that from 100% coverage from when we lived in Maryland. However, in October 2015, Orion was finally approved after 10 months (the epic struggle is another story to be shared) for Medicaid in Texas through the DeafBlind with Multiple Disabilities (DBMD) Waiver. To be eligible you have to be legally deafblind and have at least one additional disability. There is no age minimum to apply! 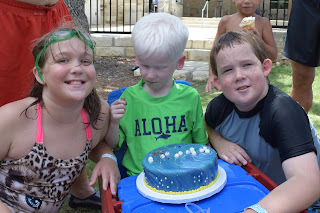 (Many thanks to the parents of deafblind Texans before us who fought for this.) So, yes, Medicaid covered the cost of these scleral shells. I enjoyed attending Active Learning workshops here in Austin so much I went twice and I would go again. There's always something I overlooked or a new perspective on play for kids with additional needs that I realize. All our kids' job from birth to 5 years old is to PLAY! In Orion's case, we'll encourage him to keep on playing no matter what. We can see he tries new things physically and he enjoys it immensely. His glee is contagious! Here's a 5-minute snippet of the hours and hours over days that Orion spends playing in the HOPSA dress. Disclaimer: It is very important to note, you really shouldn't let your kid play in equipment without the security harnesses it provides. Don't try this at home, folks! Original photo by Clare Cassidy Photography, artwork by Heather Withrow. If the functions of the Cogswell-Macy Act were already in place in 2012, two years after Orion was born, believe it or not, we may still be living in Maryland today! In a nutshell, the Alice Cogswell-Anne Sullivan Macy Act is an improvement on IDEA (Individuals with Disabilities Education Act) particularly for students who are deaf and hard of hearing, blind and deaf-blind. Texas is a hidden blessing, though. It's a different kind of beautiful than I'm used to growing up in the Seattle, Washington area. Austin is bisected by "Lake" Austin, just like the shipping canal, Lake Union and the Ballard Locks bisecting the Emerald City. Both cities don't have a professional basketball team. Both cities have city-favorite post-secondary institutions in University of Washington and University of Texas. However, the resources available for my children are not similar to what is available in Texas. Again, if the Cogswell-Macy Act features were already in effect nationally, the entire state of Washington would be educationally viable for my sons. I would have had a great case for us to move to Seattle to join the rest of my family in the region where several generations of my extended family lived/lives. Our situation in Maryland in 2012 was that with the diverse needs of our 3 children, no matter how we strategized it, only two out of our three children would have appropriate support and education in school. Our oldest son, Skyler, is Deaf, our hearing daughter is a KODA (hearing Kid Of Deaf Adults), and our youngest son, Orion, is DeafBlind. We looked at 5 other states across the USA, the programs and services were so diverse. Coming out on the top for at least the Withrow family's needs, were the Texas School for the Blind and Visually Impaired (TSBVI), the Texas DeafBlind Outreach, and the Texas School for the Deaf (TSD). Quite an impression was made on my husband and I seeing the qualified personnel working with Deaf and hard of hearing students at TSD and interveners working with deafblind students of various abilities at TSBVI. What we saw was exactly what our DeafBlind son, Orion, needed to thrive in a learning environment! Interesting tidbit: Thomas' father, Thomas, Sr., was born and raised in Dallas. He graduated from Texas School for the Deaf in 1949. He would've been so pleased he has grandsons at TSD today. Thomas, Jr. was also born and raised in Dallas but since TSD was an overflowing district placement-only program at that time, his parents were unable to send him to TSD. Because of that, they moved the family to Maryland to enroll at MSD. Thomas was 10. Back to the main story line. Sadly, the consistency and continuum in support and qualified personnel, both for Deaf and hard of hearing and deafblind students, as seen in Austin, Texas is not seen in all fifty states! 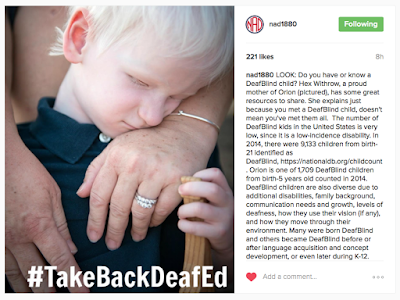 Family members of deaf blind children in other states have contacted me (and I'm glad to help!) for advice how to get their DeafBlind child the appropriate support he/she needs. What is the point of having a free and minimally appropriate public education if you don’t have qualified personnel ready to help make it “stick” in a concrete, non-abstract way? We parents are not asking for a Cadillac education. Even with a good ol’ Ford education what good is it if you can’t ‘see’ it in order to drive it? That’s where trained and qualified personnel can and will make a difference! Ah, I can dream of this happening in all fifty states, can I? I'll dream and keep on trying to do my part for our children. 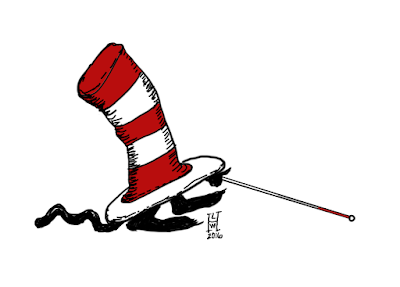 Sometimes I feel like a little speck with a little voice... but then I remember Dr. Seuss' Little Cat Z who has "Voom" in his tiny striped hat? (In "The Cat in the Hat Comes Back", Voom went on to clean up all the mess the Cat in the Hat, plus the other cats B, C, D, etc. did! Everything!) So, we need a Voom... no, a bunch of Vooms to make a boom for our children who have similarly-sized (a.k.a. low-incidence) "disability"! Who will be our Thing D and Thing R introducing the Cogswell-Macy Act on the Senate floor? A Cat In The Hat with a mobility cane. Illustration by Heather L. Withrow, 2016. I know there are voomers out there. Keep on vooming! Deaf, blind and deafblind children should be able to get their free and appropriate public education exactly where they live. They should not have to move to the state next door or across the country. The video was released on March 2, 2016, the same day 100 people were on Capitol Hill visiting our US Representatives and Senators to talk about this important bill that needs to happen.